Well I really have neglected my blog, all hell has broken loose here so I’m afraid it’s going to be a short post today….I’m running around as usual, I’ve downloaded the photos from the wedding over 1400 of them all need sorting then editing and tarting up…I may still be here in a month!! I’ve managed to do 89 today and my eyes are seeing double. My hubby’s business has been unusually busy and so I’ve been helping him out too. I’m too old for all this malarkey!! I’m also in the most foul of moods, the hubster and I lost a very dear friend last week, we were shocked as can be – he was only 52 and leaves a wife and young son….it takes some grasping. We’d known him for over 30 years, there was a group of 8 of us who all hung out in Paris together and all got married went to different countries, some had kiddies, I opted for a dog!! Anyway, I informed my workplace (a week ago) that I would need to take some time off to go to the funeral which is in France, therefore I would need just two days off, one to go over and come back on the day of the funeral. This evening at I get a phone call saying they were aware I needed some time off…. TOO BLOODY LATE!! The funeral is the day after tomorrow…what is wrong with people!! I can’t get a flight/Eurostar now, well not at a price that I can afford!! So hubby’s going on his own. I am so angry I can’t even talk. What is it with these type of people? They are so into ‘their work/business’ that they forget what it is to be human, this is really sticking in my throat, I am absolutely livid….Aghhhhhhhh I’m so angry! They should be ashamed of themselves. I need another ciggie sorry bear with me!! Anyway I now need to have a quick look for a photo for today, it will be one from the wedding but I have to be careful as the Bride and Groom haven’t seen them yet so it may be quite obscure or even one that I’m going to ditch….sorry!! Oh I also apologise for the poor posts over the last couple of days….and I haven’t even answered your kind and funny comments, I’m so sorry….I’m sure things will settle down soon. I don’t actually mind being busy but when I’m upset I’m not very good at coping with all the rest of the rubbish that’s going on…. 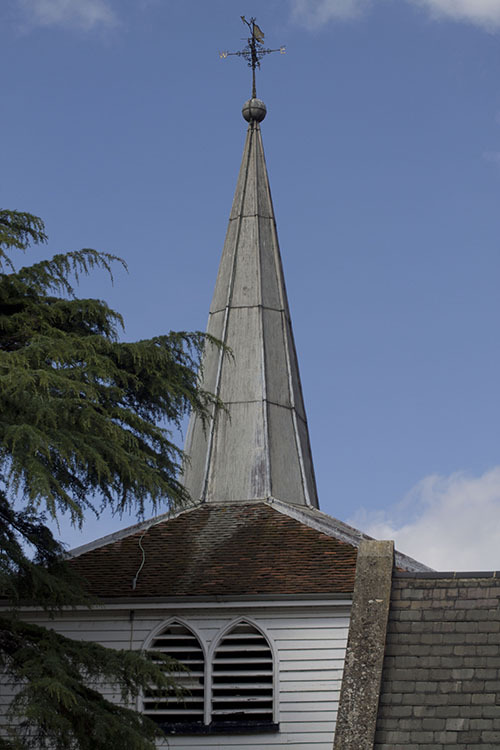 Ok here’s a photo of the spire of the church….that’s your lot I’m afraid!!! I’m so sorry to hear about you losing your friend. I do understand your anger at the people who were so careless as to cause you to miss going to the funeral. How awful of them. Some people just do not care anymore. It’s so sad. I hope things calm for you and you are feeling better soon. I so look forward to seeing the wedding photos. 1400? Wow!!! I agree with you I think it’s a sign of modern times, I’m feeling old!! On the wedding front, I think I’ve done about 300 could be a while yet!! And I haven’t stopped! !